In 15th century Spain, Juana 1 of Castile is born the second daughter of Queen Isabella of Castile and King Ferdinand of Aragon whose marriage united the two kingdoms, but it was her mother who possessed the most power and greatest influence. Beneath the intensity of her politically shrewd mother, the serious, introverted Juana grew into adolescence, well educated in Latin and music. At the age of 16, her parents betrothed her Juan to Philip of Flanders, the heir of Emperor Maximilian I. With a magnificent entourage in tow, Juana crossed the vast waters to Flanders, arriving sick and in a weakened state. At first sight of her betrothed, Juana is bewitched by his handsomeness and succumbs to his attentive charms. Philip is also intrigued with his new wife. Soon, however, intertwined with the birth of their children, Philip’s infidelity tarnishes their marriage. His strong political ambitions clash powerfully with those of her parents and Spain. All her attempts to influence Philip otherwise are thwarted by Philip’s power-hungry advisors. Juana is caught between the dreadful clashes of her mother and husband. Matters deteriorate when Philip enters into an alliance with France, historical enemies of Spain. Philip grows progressively more menacing towards Juana and her parents in his quest to rule Spain. His terrible conspiracies result in continual betrayals as Juana struggles to maintain a stance amidst a world of powerful, ruthless men. 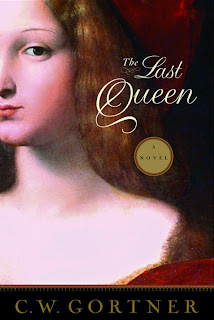 When a series of deaths strikes the royal heirs of Spain, Juana is forced to become queen with Philip as her royal consort. Before long, she is betrayed on all sides by callous, authoritative men, and Juana finds herself imprisoned for madness. Christopher Gortner spins a grand tale of opulence and deception, privilege and destruction, madness and fragile love. His riveting prose grabs the reader’s emotions from the very start and twists and wrenches them until the very poignant ending. Inspired by his love for his Spanish heritage, Christopher Gortner paints a vivid picture of life in 15th century Europe. He writes in an evocative prose, rich in quality and simplicity. Books like this happen rarely. The author is a skilful writer who artfully relays a rich story peppered with unpredictable twists and turns that keeps the reader enthralled upon every word to the very end.